What a weekend! I'm back home, safe and (mostly) sound, after an amazing weekend at OwlCon! Events started Friday evening, and we were ready! 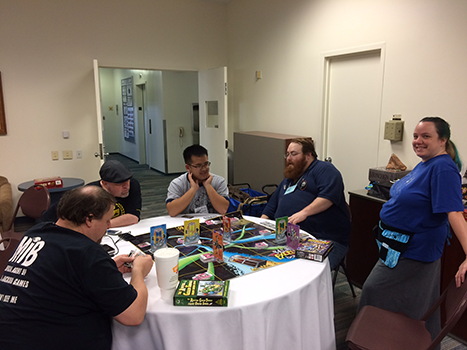 We kicked the convention off with some autodueling fun in Car Wars: The Card Game. There was a great turnout for Revolution! (with the Anarchy expansion), and plenty of feline mayhem was made with Simon's Cat Card Game. Sanity-blasting fun came from The Stars Are Right, and Gotham City's greatest supervillains made off with lots of loot in Batman: The Animated Series Dice Game. Of course, we also played LOTS of Munchkin that night as well! Saturday at OwlCon was even better! 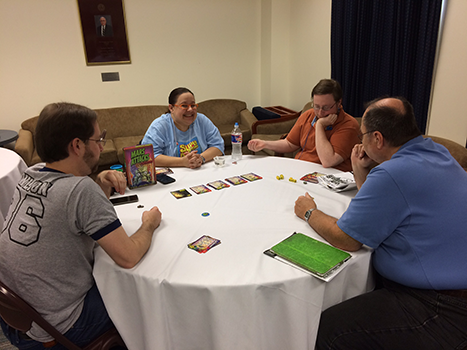 Munchkin was suitably represented, and we had a lot of fun with our original set mixed with Munchkin Oz. Players were able to study for their oral history exams using our most-excellent, giant-sized copy of Bill & Ted's Excellent Boardgame, while others had spooky fun haunting kids and taking their candy in Ghosts Love Candy. Ogre swept into OwlCon with Ogre Sixth Edition and Ogre: Objective 218. Command Posts were destroyed and Ogres were pummeled - smiles all around! 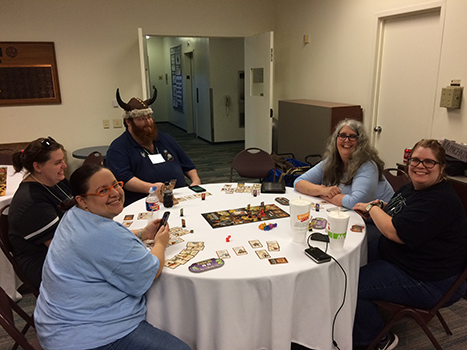 Sunday was not as busy, but still a ton of fun playing many games, including Munchkin Steampunk! It's been a few years since I've been to OwlCon, and it was even better than I remembered! 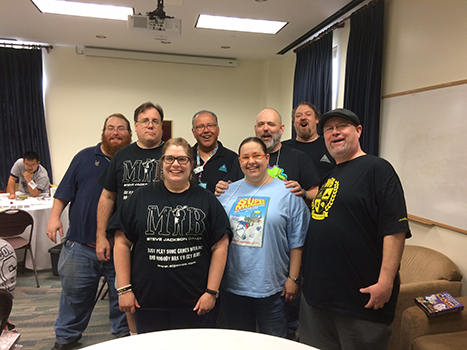 Thanks to everyone who came by the Miner room, as well as the wonderful OwlCon staff. Houston MIB Demo Team members Chris, Don, Jessica, John, Marybeth, Maurice, Neal, and Sarah did a great job running events. Ettin Games carried plenty of SJ Games releases in the dealers' room. We wouldn't have had nearly as much fun without all their generous support. If you weren't able to attend, you can check out our games at your friendly local game store. If you don't have a store nearby, then check out the offerings at Warehouse 23. In any case, see you at the next #SuperbOwlCon!